Here are a few good links to help you along. Posted on April 15, 2019 April 15, 2019 Author SharonCategories Blog, Publishing, Shameless Self-PromotionLeave a comment on Fortune’s Favors Live Today! Now that the paper editions of Fortune’s Favors are landing, I’m going to do that Author Thing where I ask those who have (already!) read the book to please review it. Amazon will now accept reviews, and, assuming some kind person has made a page for it, so will Goodreads and LibraryThing. Or, if you have a blog where you talk about books — you know the drill. Amazon’s early release of the paper edition is an Opportunity to really get the word out about the new book, and influence people who are on the fence to take a chance. So! 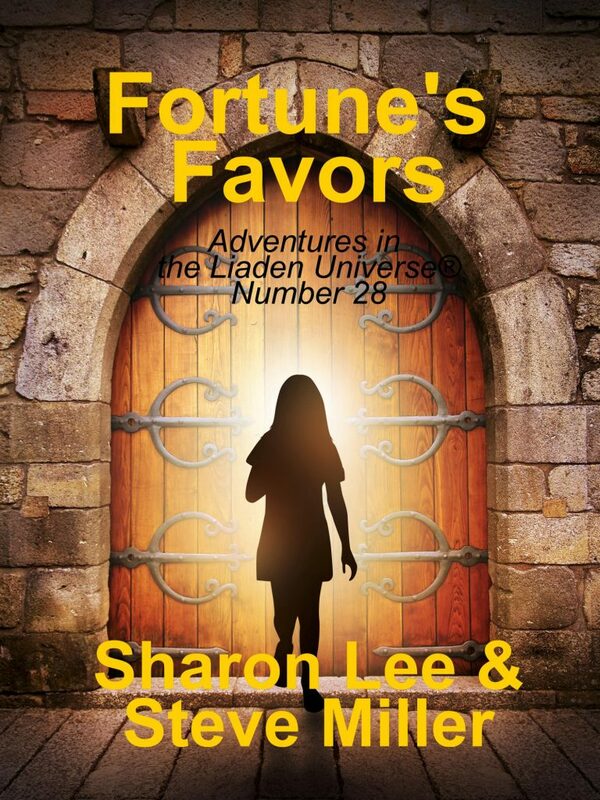 If you can, please do boost the signal for Fortune’s Favors: Adventures in the Liaden Universe(R) Number 28, by Sharon Lee and Steve Miller. So! Amazon has let the paper edition of Fortune’s Favors out into the wild early. If you order it today, you can have it in your hands, it says here, on Wednesday. The electronic editions will be released on April 15; I cannot undo this, so Waiting Is. Below is a revised list of buy-links and! for the very most patient among us, a snippet from the chapbook. It was to the gayn’Urlez Hell in lower Low Port that his feet finally brought him, over the objections of most of himself. The gayn’Urlez Gaming Hell occupied the corner of two such thoroughfares, and the best that could be said of them is that they were. . .somewhat less unsafe than the Hell itself. Mar Tyn eys’Ornstahl had made it a policy – insofar as he was able to make policy – not to enter gayn’Urlez, much less work there. “I’m not a pleasure-worker,” he said, gently. There will be a paperback edition available from Amazon only*. It may be that the paper book will also at some point be available for pre-order, or it may simply appear as ready to order whenever the Amazon Vetting Process is complete. Amazon is not perfectly clear on this point. *Yes, I know BN offers the option of making a paper book through them, but they do not offer an easy option, and I should’ve started back with the book due in September two weeks ago, so I have no time to bother with fiddly and opaque online publishing programs. All righty, then! 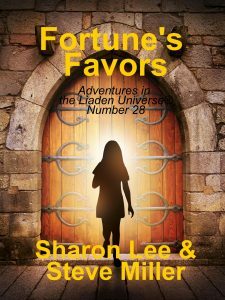 In Beautiful Theory, Fortune’s Favors: Adventures in the Liaden Universe(R) Number 28 will go on sale at Baen, B&N, Kobo, Amazon, the IThing Store, Google Play, and a buncha teensy tiny venues on April 15. It may go on sale before April 15 in some venues — doncha love that element of uncertainty, there? Puts you right up on your toes, is what I’m sayin’. I trust y’all know what to do. Posted on April 5, 2019 April 5, 2019 Author SharonCategories Blog, Publishing, Shameless Self-PromotionLeave a comment on Fortune’s Favors Update! Is in the proofing and recompiling stage. We hope to see it for sale, as an ebook and (from Amazon only) a paper book on-or-near April 15. We will tell you when it can be ordered, or you can, as above, watch the skies. Herewith, the cover and the teaser. Mar Tyn eys’Ornstahl is a lucky man. His very presence can determine the fall of a card, the spin of a wheel, or whether the bread will rise or fall. In fact, Mar Tyn eys’Ornstahl isn’t merely lucky. Mar Tyn is a Luck; a focal point for the elemental force of random event. While most people think that there is good luck and bad, Mar Tyn knows better. Luck is Luck; only the aftermath of Luck’s presence can be found to be good or bad. Mar Tyn’s Luck, for instance, has recently cost him his home, and his savings. He has only one thing left to gamble. Posted on March 26, 2019 March 26, 2019 Author SharonCategories Blog, Shameless Self-PromotionLeave a comment on Neogenesis Mass Market Book Day! Are you among the dozens of readers who wants a signed*, even, a personalized** copy of A Liaden Universe® Constellation Volume 4? You may now preorder your signed and/or personalized copy from the Uncle. RULE ONE RE PERSONALIZATIONS: the authors reserve the right not to inscribe a requested personalization, should said personalization offendeth them. There is no appeal of the authors’ refusal. PRO TIP: Do not offend the authors. RULE TWO IN RE PERSONALIZATIONS: Check your spelling! The authors will exactly reproduce what you have typed into the instruction box. If you made a spelling error, there will be a spelling error in your personalization. **PERSONALIZED means the authors write their names and a personalized inscription, requested by the person buying the book, RULE ONE RE PERSONALIZATIONS, above, applies. You all of course know that the eArc of Liaden Universe® Constellation Number 4 is now available directly from Baen books, here. This Constellation includes previously published short works Street Cred, Due Diligence, Friend of a Friend, Cutting Corners, Block Party, Degrees of Separation, Excerpts from Two Lives, and Revolutionists — together again for the first time! The tradepaper and ebook editions of Constellation 4 will ship on — appropriately enough — June 4. Also! On March 26 — Good Ghod, that’s this coming Tuesday! — the mass market edition of Neogenesis, the twenty-first novel of the Liaden Universe® created by Sharon Lee and Steve Miller, will hit the shelves at your favorite bookstore. Neogenesis is the direct sequel to The Gathering Edge and! the immediate prequel to Accepting the Lance. NOTE: Uncle Hugo’s SF Bookstore in Minneapolis will be taking pre-orders for signed copies of Constellation 4 and Accepting the Lance. Pre-orders for …Lance will open after Labor Day. We do not have a firm date for the opening of pre-orders for Constellation 4, but realsoonnow is a good guess, so keep an eye on the catalog, here. The other things you need to know, in re Liaden publications are! *”Dark Secrets,” a brand-new Liaden short story, will be published in the anthology Infinite Stars: Dark Frontiers in September. *Anniversary edition of the second Liaden Universe® novel, Conflict of Honors, will be published in November as a mass market paperback. We also have five novels still under contract. One of those novels is the book due in September, detailing the Further Adventures of the Dutiful Passage, which are happening concurrently with the action in Accepting the Lance**; another is the third Jethri Gobelyn novel, direct sequel to Trade Secret. No, we have no idea what-or-who the other three novels will be about. They will be Liaden Universe® novels, because the contract says so. *Do not, for the love of ghu, ask me ANYthing about an eArc. **So concurrently, in fact, that we tried to write both books at the same time. Which worked about as well as you might imagine. After a review of procedures and past adventures in the taking of pre-orders, Uncle Hugo has agreed to undertake the task. The pre-order option for signed copies of Accepting the Lance will appear in the Uncle Hugo’s online web catalog after Labor Day. Repeat: Yes, there will be signed books available from Uncle Hugo’s, which you may order after Labor Day. Yes, I will post a reminder (and, as in past years, instructions) when ordering is live.